Since 1900 only 14​ major league baseball players have hit 4 home runs in a game. It is a rare feat and far rarer than a triple play and even more rare than an unassisted triple play. The greatest home run hitters in baseball history like Babe Ruth and Hank Aaron never did it. Even the great steroid home run hitters like Barry Bonds and Mark McGwire never accomplished the feat. Two players did hit 4 home runs in a game in the 1890's. Bobby Lowe in 1894 and Ed Delahanty in 1896 but they were playing a type of baseball that was quite different than today and are not included here. The first modern player to hit 4 home runs in a game was the Iron Horse himself Lou Gehrig. He accomplished the feat on June 3, 1932 as his New York Yankees defeated the Philadelphia Athletics 20-13 in Philadelphia. On Gehrig's last at bat of the day he flied out to deep center field with the center fielder making a running over the shoulder catch and the center field wall still off a ways as it was 470 feet to center in Shibe Park in Philadelphia. Had the center fielder missed the ball it would have been an inside the park 5th home run. Yankee second baseman and Hall of Famer Tony Lazzeri hit for the cycle in the same game. 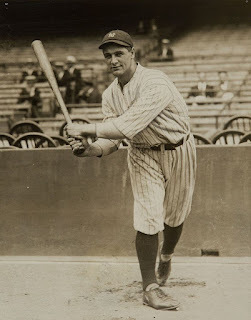 Klein was a great home run hitter leading the league 4 times in home runs and on July 10, 1936 he hit 4 home runs while playing for the Philadelphia Phillies but he hit his 4th home run in the 10th inning of the game. The Phillies won the game vs the Pittsburgh Pirates by a score of 9-6. Seery was a free swinging outfielder who lead the league four times in strikeouts and never had over 485 at bats in any year playing mainly for the Cleveland Indians back in the 1940's. His lifetime batting average is just .224 but on July 18, 1948 shortly after being traded from the Indians to the Chicago White Sox Seery hit four home runs vs the Philadelphia Athletics in a 12-11 win with Seery's last home run winning the game in 11 innings. On August 31, 1950 Gil Hodges of the Brooklyn Dodgers belted 4 home runs as the Dodgers crushed the Boston Braves 19-3. Hodges later became the New York Mets manager and led them to the improbable 1969 World Series Championship over the heavily favored Baltimore Orioles in one of the great World Series upsets of all time. On July 31, 1954 Joe Adcock of the Milwaukee Braves slugged four home runs against the Brooklyn Dodgers as the Braves pummeled the Dodgers 15-7. Adcock batted 5 times in the game and in his non home run at bat he doubled off the top of the left field wall just missing 5 home runs. On June 10, 1959 Colavito hit 4 home runs for the Cleveland Indians as they defeated the Baltimore Orioles 11-8. In 1960 the Indians promptly traded Colavito to the Detroit Tigers and started the Curse of Rocky Colavito. On April 30, 1961 the Say Hey Kid blasted 4 round trippers against the Braves leading the San Francisco Giants to a 14-4 win. With 660 career home runs Mays is the player with the most home runs to have hit four in one game. On April 17, 1976 Schmidt hit four home runs in a wild extra inning game as he lead his Phillies to an 18-16 win over the Chicago Cubs. On July 6, 1986 Bob Horner on the Atlanta Braves cracked 4 home runs to no avail as the Braves lost to the Montreal Expos 11-8. Horner is the only modern player to hit 4 home runs in a losing cause. On September 7, 1993 "Hard Hittin" Mark Whitten smashed 4 home runs for the St. Louis Cardinalsas they defeated the Cincinnati Reds 15-2. Whitten drove in 12 of the Cardinals 15 runs which ties him for the all time most RBI's in a game with Jim Bottomley. Whitten is the worst home run hitter of the 13 to accomplish the feat to date. His home run average is just 3.4%. On May 2, 2002 Mike Cameron hit 4 home runs and lead the Seattle Mariners to a 15-4 win over the White Sox. Cameron is the second worst home run hitter on the list with a home run average of 4.1%. Just 21 days after Cameron accomplished the rare feat Shawn Green also hit 4 home runs on May 23, 2002 leading his Los Angeles Dodgers to a 16-3 trouncing of the Milwaukee Brewers. Green also had a double and single in the game going 6 for 6. On September 25, 2003 Carlos Delgado became the last player to date to hit 4 home runs in a game as he lead his Toronto Blue Jays to an 8-6 win over the Tampa Bay Rays. Delgado only batted 4 times in the game and homered each time. On May 8, 2012, Josh Hamilton hit four home runs in a game while playing for the Texas Rangers vs the Baltimore Orioles. The Rangers won the game 10-3 and Hamilton set the American League record for most total bases in one game with 18. Hitting four home runs in a game is an extremely rare and difficult feat and we are entering the 5​th year since a player has done it. The longest gap between players hitting 4 home runs in a game is 16 years from Willie Mays in 1961 to Mike Schmidt in 1976. If a major league baseball player accomplishes this feat this year everyone should take notice because he will have accomplished a very rare feat indeed.